Recognising patterns and things that match are vital skills for math and literacy. Find out why matching and sorting are so important, and use these free Valentine pattern matching cards to help your children develop these skills in a fun, hands-on way. We learn by linking new knowledge to concepts we already know. This makes our learning relevant to us and gives it context. It develops a wide and deep understanding of topics, and helps our learning stick. This way of learning also promotes creativity, as we pair up things that haven’t matched before in new and innovative ways. This is why I love to create resources that join art, math, science, and literacy together around one topic, such as my Spring Workshop; or matching art with maths, to strengthen both topics, such as in my Art of Circles workshop. Today you can print these Valentine pattern matching cards to include in a Valentine math station, or to include in your Valentine’s Day activities for your children. These simple pattern and matching games lead the way into much more complex learning later on. Math and literacy skills are based on matching and patterns. We group numbers into odd and even; match together numbers numbers that are divisible by three; group multiples of ten. We use these skills in grammar and vocabulary work too: sorting nouns and adjectives; learning names of animals; collecting words that describe feelings. 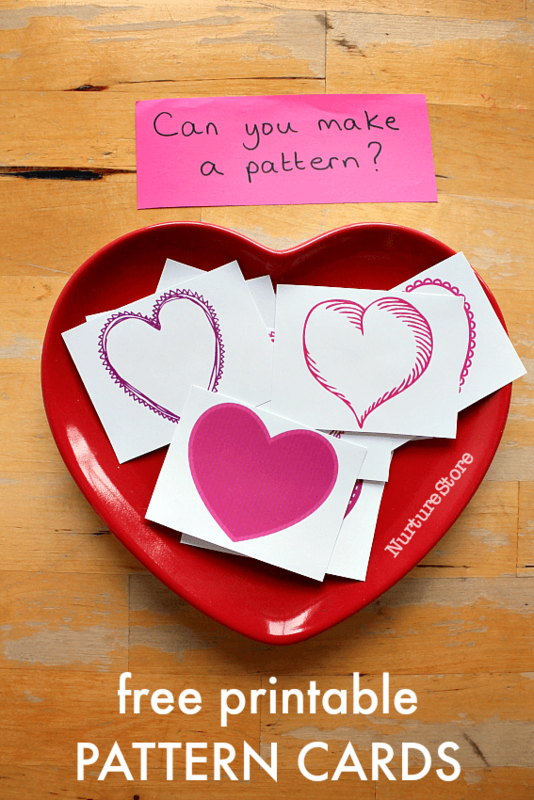 Use these heart cards to have fun with matching, sorting, and patten games. 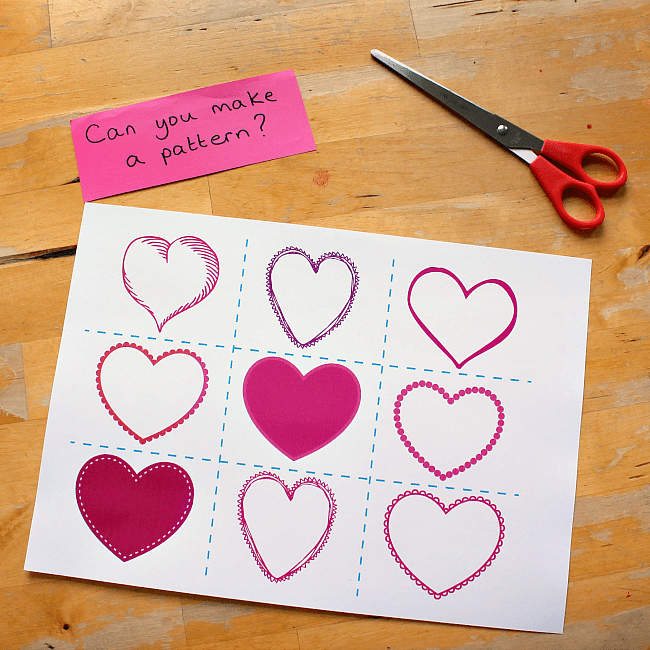 Print the hearts and cut out the individual cards, either as rectangles or heart shapes as you prefer. Print several pages so you have a few of each kind of heart. :: you can also hide the hearts around the room or in a Valentine sensory tub, and invite your children to hunt them out. Then sort them into different classifications/ groups. Put all the red hearts together, all the pink together, and a final pile for the purple ones. :: Sort them into groups based on the individual design of the hearts – a great exercise in visual discrimination, encouraging your children to look carefully and find differences in shape, size, colour and design. 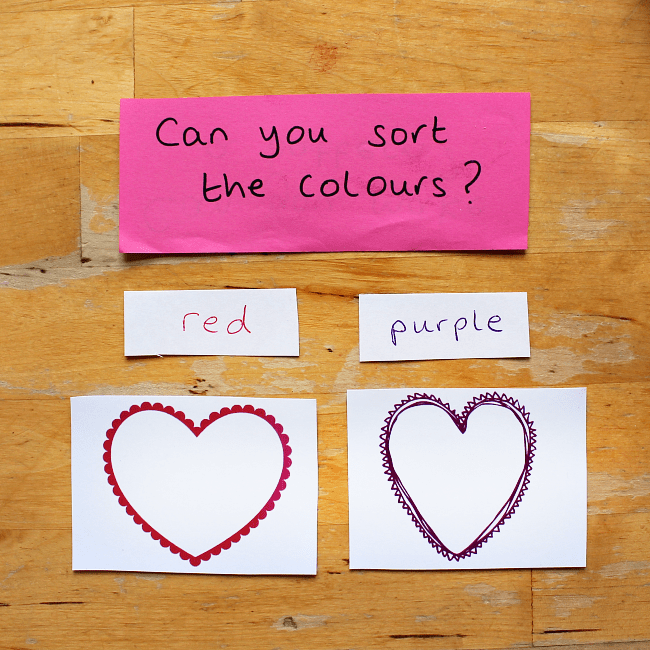 Very young children might spot differences in colour, older children can see much more detailed differences and sort the hearts into more specialised groups. Watch your children play and see which stage they are at. Did you see all my other Valentine's Day activities for children? 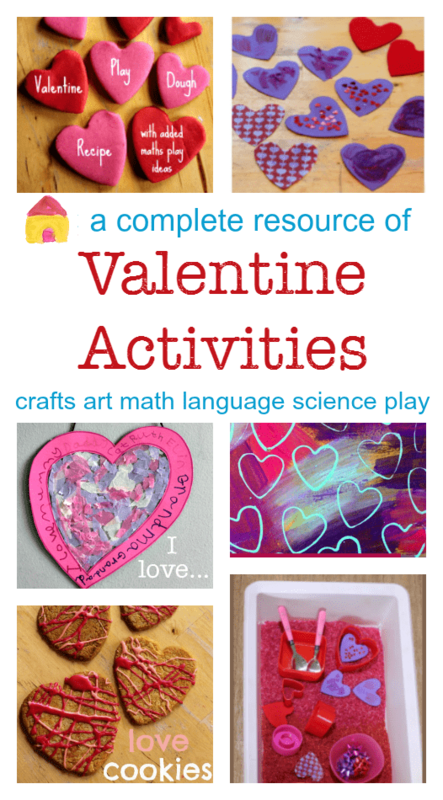 I've got more free printables, art, math, science, literacy and play ideas, all with a Valentine theme. You can find them all here.